Those who thrive in the world of DJ-ing would certainly agree that it is a very rewarding job. While older models of turntables serve those who love classical music, advancements in technology have made it possible for the modern generation to enjoy even modern versions of DJ Turntables. Before reading the review let’s read to know how to choose a best dj turntables. There are different types of motor that are used in turntables. Direct drive turntables use motor that is placed beneath the platter center, directly attached to it. This makes it possible for a higher torque, with lower flutter. On the other hand, belt drive turntables use a motor that is placed off the center of the platter, attached to it using a rubber belt. These motors have lower torque, with greater platter speed fluctuations. A turntable with a higher torque is one with which the platter accelerates to its proper speed after pressing the Start button. It will not slow down while you are still holding a record that is still on the slipmat. There are features that are not necessarily available in all models. However, those with more features generally do more functions. Among the features that you can look into include digital output, adjustable pitch range, reverse, master tempo, BPM counter, adjustable torque, as well as interchangeable tonearm. The Stanton STR8150 model is a premier turntable model from the DJ lineup of the manufacturer. The upper part of this turntable is made of all steel. The lower part, on the other hand, is made of heavy rubber substance which is perfect for isolation and dampening purposes. The Stanton STR8150 High Torque Direct Drive DJ Turntable also comes with internal grounding, which means that there is no need for those clumsy pre-gig, alongside its reverse play button. The cartridge is also included in its packaging, allowing you to have reliable, solid, and precise equipment which is perfect for those who are searching for a professional level, heavy weight tool to further hone their art. This model also comes equipped with a pitch control that ranges up to 50 percent, together with 25 and 8 percent options. DJs will also love the pop-up light which is designed for easier replacement. These are some features that modern DJs love about this tool from Stanton. Other interesting features of this model include having an excellent quality of a motor, as well as the capability to play 33, 45, as well as 78 RPM records. It also comes with a reverse play button, adjustable pitch range buttons, separate start and stop speed adjustment knobs as well as two start and stop buttons. They are all aligned in the best position which allows easier access for DJs who prefer placing their decks in the right location. Professional DJs will certainly appreciate its heavy duty steel construction as well as other features including reverse, key correction, S/PDIF digital outputs, as well as up to 50% pitch adjustment. With all these features combined, there is no doubt that this model is the best in this list. 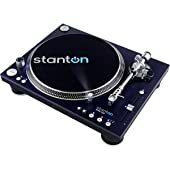 I believe that this model from Stanton is no doubt a good DJ turntable equipped with the best motor there is, compared to other models. 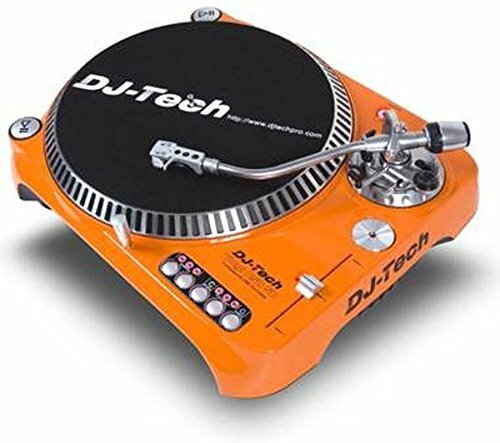 It is well recommended for turntablists or DJs who are very serious about this craft, and needs a high quality machine that can help in honing their skills. It seems that there is a special part in the world of DJing which still gives vinyl a spot. This is what this model is striving to achieve. Even though the Pioneer Pro DJ PLX-1000 is somewhat similar with the Super OEM models, the manufacturer have added more features which make it rather unique in its own way. Pioneer is a brand name that is popular in DJ booths all over the world. It has earned a good reputation that it has even become an industry standard for most media players. Aside from its modern black-brushed looks, together with its blue LEDs, there are similarities with the traditional Technics build. This model comes with a signal path that is purely analogue. Since there is no line level of pre-amp that is built-in, its audio signal is directly fed from the tonearm contacts right through the RCA jacks beneath the body. It also has a ground wire, which may be considered as traditional, but it is what it makes the creation of great sound using real vinyl, and with the right type of cartridge used. The sockets of this model are recessed far into its body, which means that there is no need for a right angle plugs to user the decks comfortably in battle style compared to a mixer. The performance of its motor is excellent, with a higher torque compared to a 1200. The startup time is rather quick, with no adjustable time for start/stop. Another amazing feature of this model is its excellent sound design. It is possible with its heavy mass, and die cast zinc chassis which prevents vibrations and resonance. The rubber insulated tone arm works in reducing the howling effects, while the springs and rubber on the dampening parts absorb outer vibrations. This model is designed for venue installers/owners who do not want to purchase a second hand pack for their system. What makes this option a good one is that it comes with a warranty, as well as an after sales support coming from a brand that is trusted and famous in this industry. This turntable model comes with a dependable steel construction for its upper body, while the bottom part is made of heavy rubber, thus allowing for dampening. The surface is dark and polished on most parts of its body, while the color theme is mostly black and silver, which makes it a safe option. It comes with a direct drive motor, and the capacity to play three types of records (33, 45 and 78). Users can also use the different controls on this turntable, including the pitch control buttons, reverse play, chords lock button, battle style features, target lights, brake/start adjustment knobs, and several others. The model also supports reverse play. All of the turntable buttons feel solid and tough with a clicky sounds and rubbery surface to allow DJs that they are activated. The tonearm used is similar to that of Stanton ST-150 which is designed as a firm S-shaped arm, with a completely manual control. Another feature that is loved by many is its USB port which makes it easier to transfer vinyl music to a PC. A smooth turntable mat and a dust cover are included in the set. This model is well-constructed equipment which is equipped with all features that a vinyl lover or a DJ would ever need. Its pitch control slider is constant throughout the course, enabling for greater precision as you beat match close to the zero mark. It also comes with a quartz lock button, resulting to an easy to bypass pitch control when there is a need to reach zero percent. 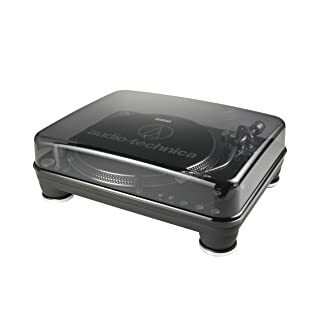 Audio Technica AT-LP1240-USB Direct Drive DJ Turntable is designed and built to offer exceptional reproduction of music, even under demanding professional conditions. It uses a highly powerful 16-pole direct drive, three phase motor which is known for its consistent speed stability, together with its easy back cueing, reverse and forward play, and an assurance of quiet operation. 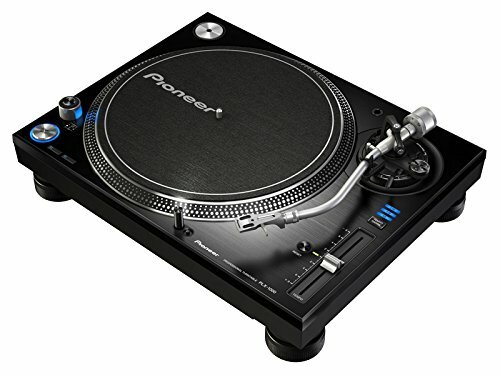 Other standout DJ friendly features of this model include a damped cast aluminum platter that comes with stroboscopic speed markings, as well as a slip mat, start/stop button, adjustable pitch control, removable stylus target light, hydraulically damped lift lever, dedicated tone arm grounding lug, as well as a locking tone arm rest which keeps both the cartridge and the arm safe in place while transporting. One of the reasons why I think that this model deserves a spot in this list is its affordability, compared to other models. One of the reasons for this is because you need to buy a separate cartridge for the AT-LP1240 model, and install it on your own. In the modern race for high quality DJ turntables, Reloop RP-7000 deserves a winning spot. 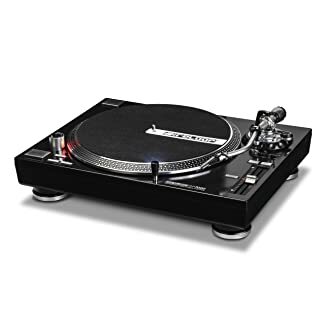 It comes in a similar box metal design with that of the Technics SL-1200 line, but quite simple compared to the expectations set by pro DJs all over the world. This model is one of the purist options in this line, serving as a club ready choice for DJs. One of the features that are considered as a stand out with this model is that it comes with a digitally controlled, dramatically wide pitch range that is available. This is designed for battle DJs who will surely appreciate its two start/stop buttons, allowing it to adapt easier to different turntable orientations. It also has a starting speed that is adjustable in between 0.2 and 6 seconds which allows for better control over its direct drive motor. Other new features included in the RP-7000 model is its reverse button, which is a little safety lid located around the on/off switch. It also has a clickless pitch slider which makes it possible for more precision when it comes to beat matching. What I really like about the RP-7000 model from Reloop is that it comes with the most convenient innovations right at the connectivity level, with two RCA sockets, rather than having the standard hard wired cables of other models. It also has a switch between phono output levels as well as line ones, thus allowing it to be used together with other mixers which do not have phono inputs. Overall, this is a professional, dependable club turntable with a very familiar design, and new amazing features. It is surely a great value for your money. This turntable is the perfect solution for all DJs who are in search for a high torque, professional, club standard turntable with a virtually indestructible construction and strong motor. With its scratch-resistant, classy metallic finish, it is not just designed for club use, but it also looks amazingly cool. The DJ Tech SL1300MK6USB-ORA Direct Drive DJ Turntable is a high torque, direct drive, turntable which also comes with a USB output. This is a good move by DJ Tech to introduce this feature to a vinyl turntable in a world where there is a diminishing production of vinyl turntable options. This USB output may be used in directly recording music from the unit into computers, both Mac and Windows. It also offers support for different playback speeds, up to 50% pitch control, detachable head shell, which is ready for any type of vinyl DJing gigs. 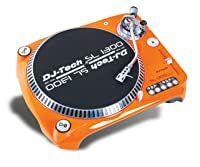 I believe that the DJ Tech SL1300MK6USB-ORA Direct Drive DJ Turntable is the perfect equipment for use for DJs who are interested in having a durable turntable. Aside from its sturdy makeup, it also comes with features that make it a good option for a modernized version of a vinyl turntable. As you start scouting for the best DJ turntables, you can consider the options that are listed above. If you ask other DJs which models are best for them, they may give you different answers. This is because there is no single model that is perfect for a user. It always boils down to your personal preferences and needs. Every model provided above comes with their own set of advantages and disadvantages, which means that it is up to you to determine which one works amazing for you. Make sure to take your time in checking the options available in order to make a well-informed decision before you make your purchase. For people who need a turntable with build-in speaker, please refer to here.